If you, like me, missed San Diego Comic-Con this year, you also missed the Star Wars: The Clone Wars panel hosted by Pablo Hidalgo with two of the creative forces behind the show: Dave Filoni and Matt Michnovetz. The panel not only revealed a few clips from the upcoming Season 5, but a few interesting World War II connections in Season Four's Umbara arc. 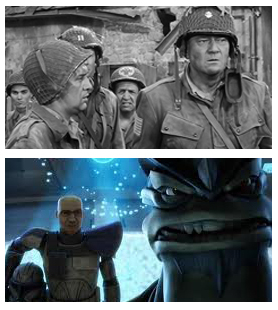 This isn't the first time that World War II and war films served as inspiration for Star Wars: The Clone Wars. In fact, Lucas originally pitched The Clone Wars to the media in 2008 as "sort of like Band of Brothers only with Jedi." However, this does seem to be the first confirmation of multiple WWII films being used for one episode or arc. As a bonus, The Longest Day was directed by Ken Annakin, the British filmmaker and namesake of Anakin Skywalker. I'm off to find out what scenes from The Longest Day, What Price Glory, and The Caine Mutiny were used as inspiration. In the mean time, head over to StarWars.comhttp://starwarsblog.starwars.com/index.php/2012/07/15/the-quotable-clone-wars-panel-report-from-san-diego-comic-con/ for all the details.